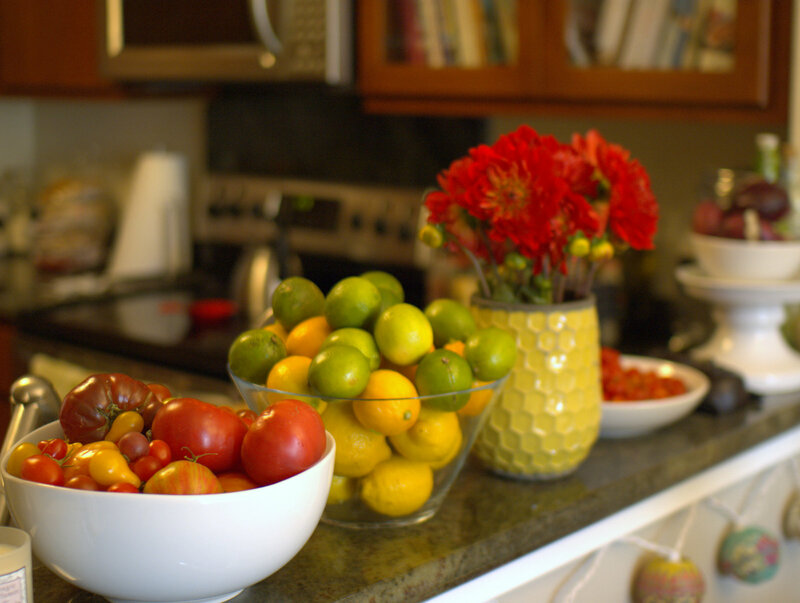 Ooooh, heirlooms….I’m getting a bit giddy. 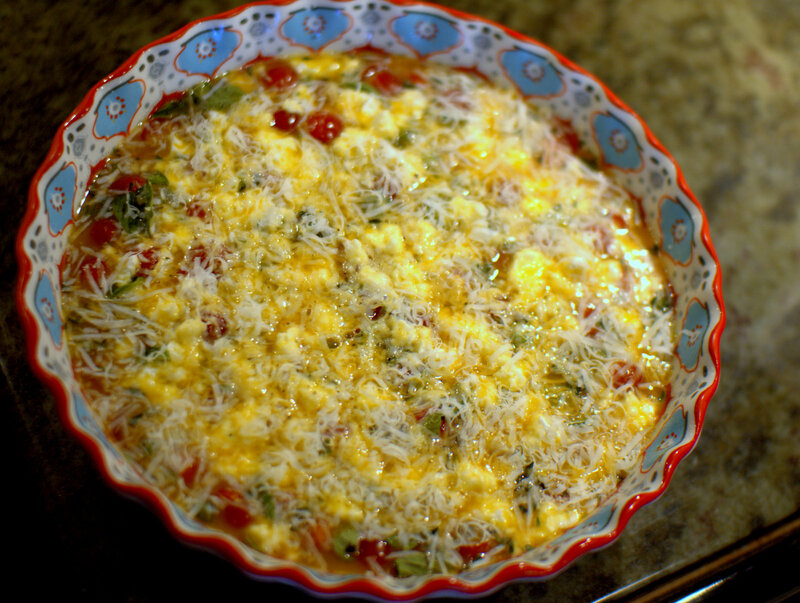 Time to fortify with a good, nay – an excellent – breakfast that welcomes in the summer with open arms. Throw into a dish: some fresh herbs, the ripest tomatoes, and any other quick-sauteed summer veg that your heart desires. 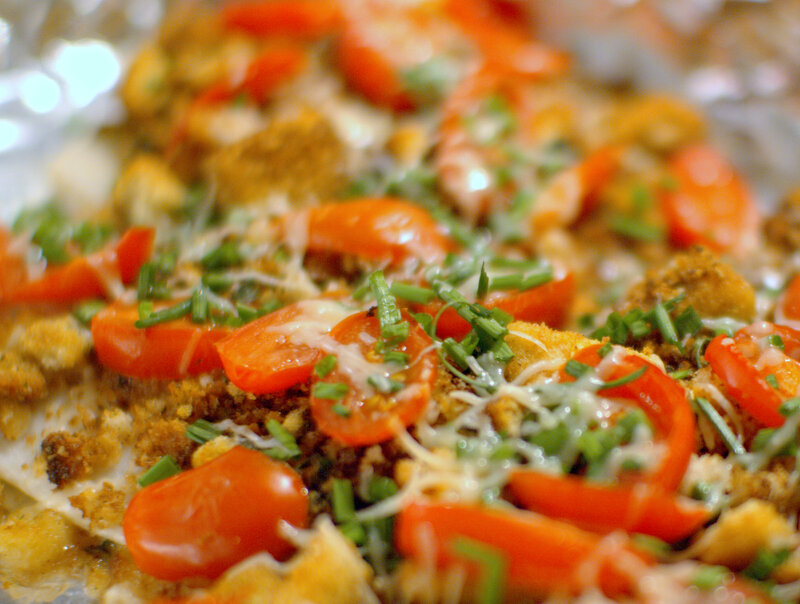 Sprinkle with one, or two, or three kinds of cheeses that you adore. Beat some eggs with a pinch of flour and pour it on top. Bake it today or maybe just keep it in the fridge for tomorrow morning, when you are sure to be hungover or otherwise sluggish. And voila! 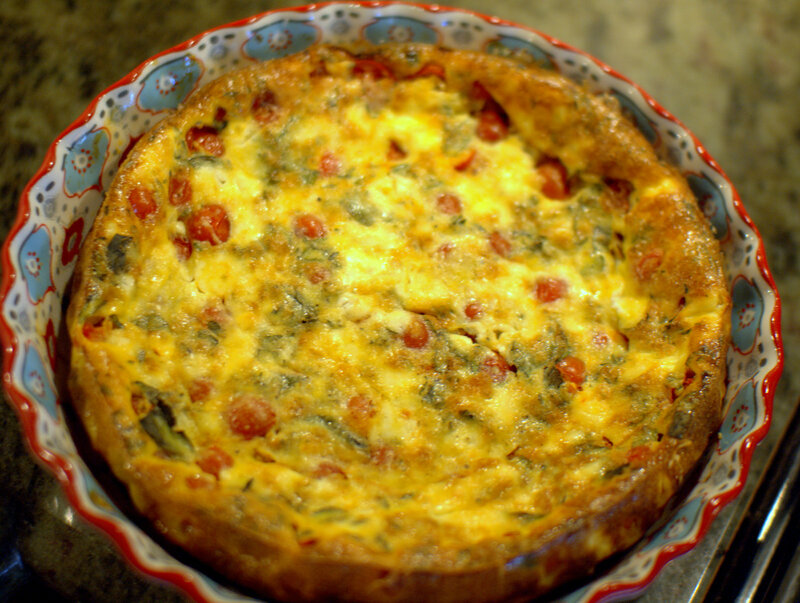 A hearty, yet elegant breakfast frittata with the best of summer therein. 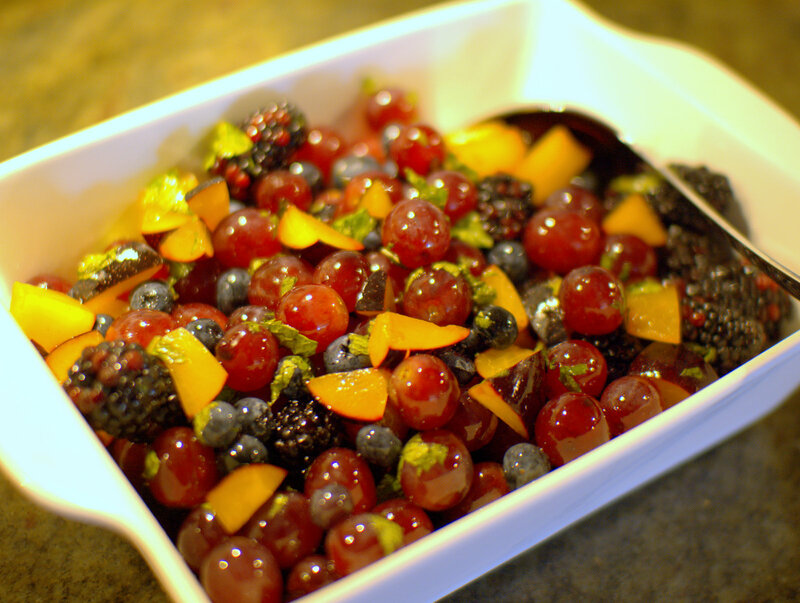 Fruit salad with melons and *shudder* bananas is not for me; I’d rather stab my fork into my eye – or this minted collection of ruby red grapes, blackberries and plums. Cherries are welcome, as are other berries and stonefruit. 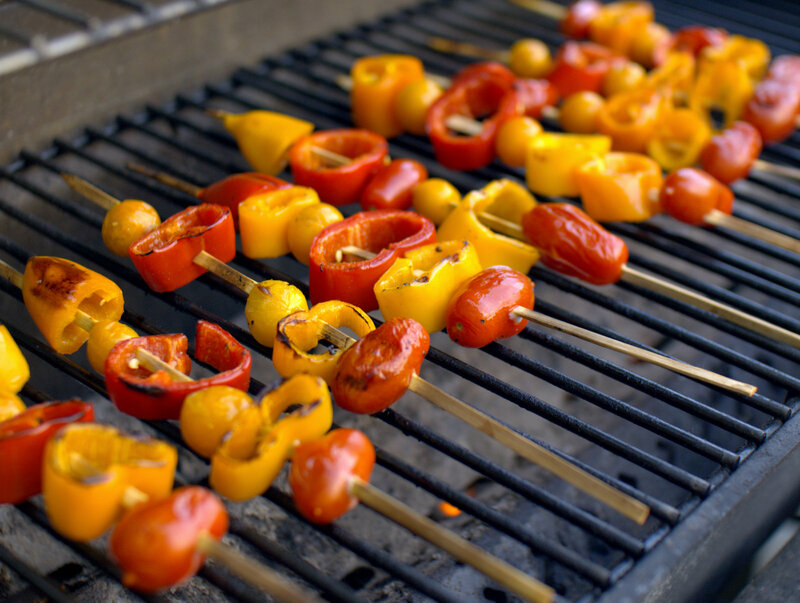 Or, save your stonefruit for the grill. 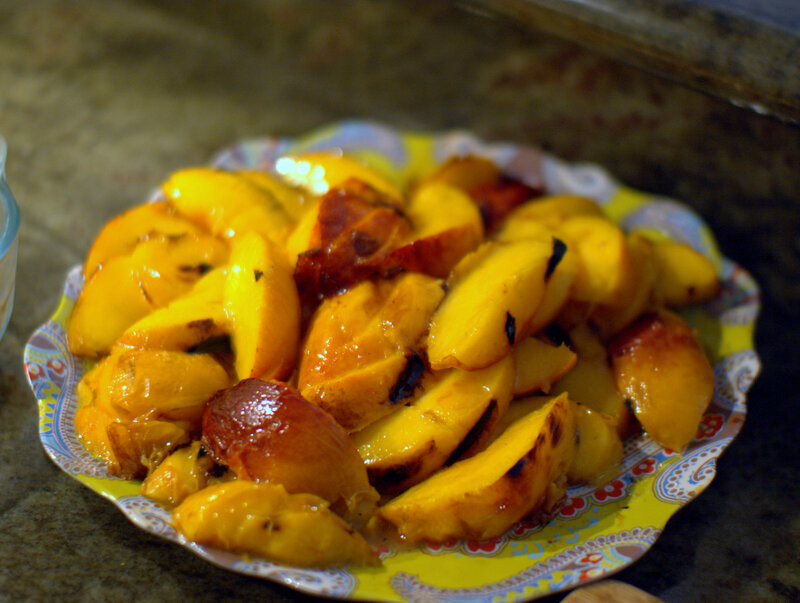 Place your buttered-and-brown-sugared peach or nectarine halves on a medium-high heat grill that is generously oiled with high-heat cooking spray, and grill for 3-5 minutes on each side until you get nice grill marks but before the fruit is too mushy. 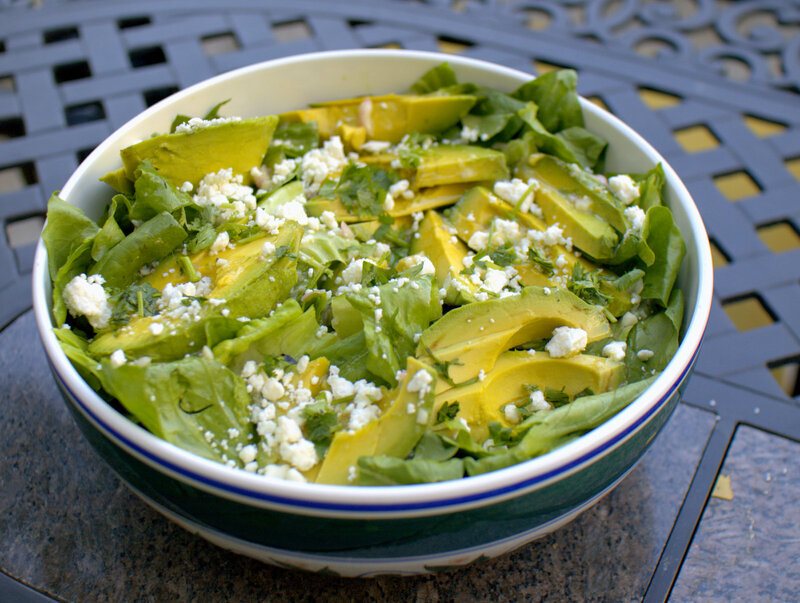 Slice ’em up and pile a plate high with this summer gold. 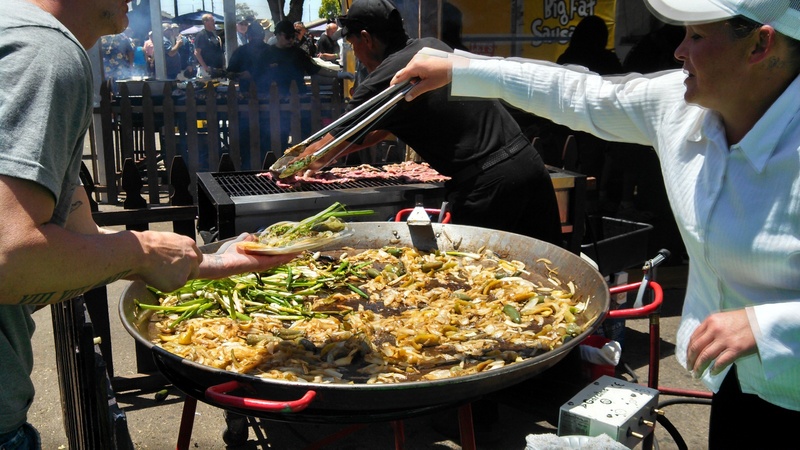 Don’t turn off the grill just yet – did you know you can grill French toast? And did you know that it is awesome? 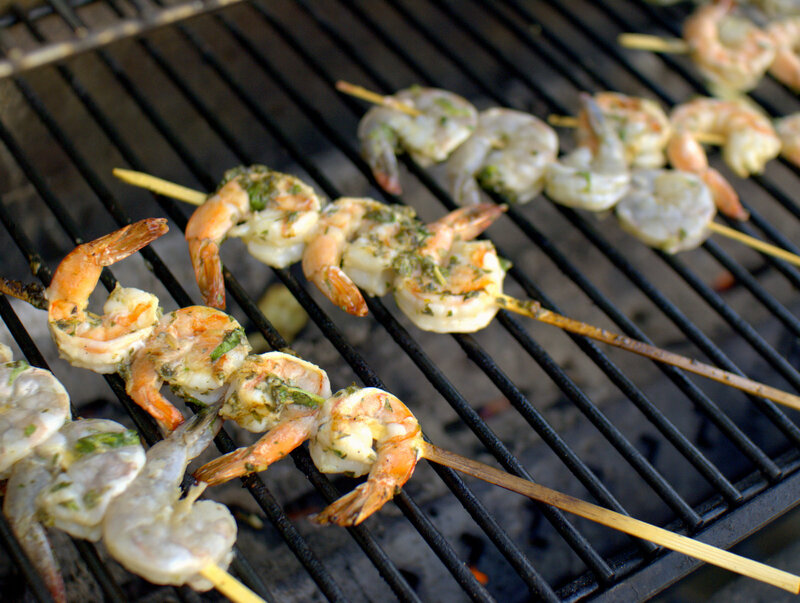 The key is to makes sure those grill grates are oiled, oiled, oiled (I use high-heat non-stick cooking spray) so that the sticky bread doesn’t stick too much. The result is a beautiful smoky and caramelized crust with souffle-like custardy goodness inside. 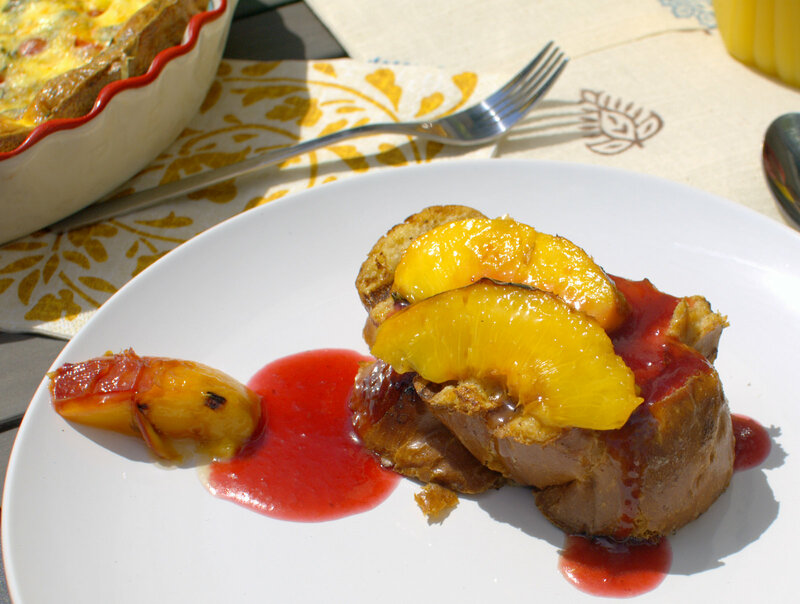 Serve them with grilled nectarines and a simple raspberry syrup to entice summer to take a seat, have a drink, and stay a while. 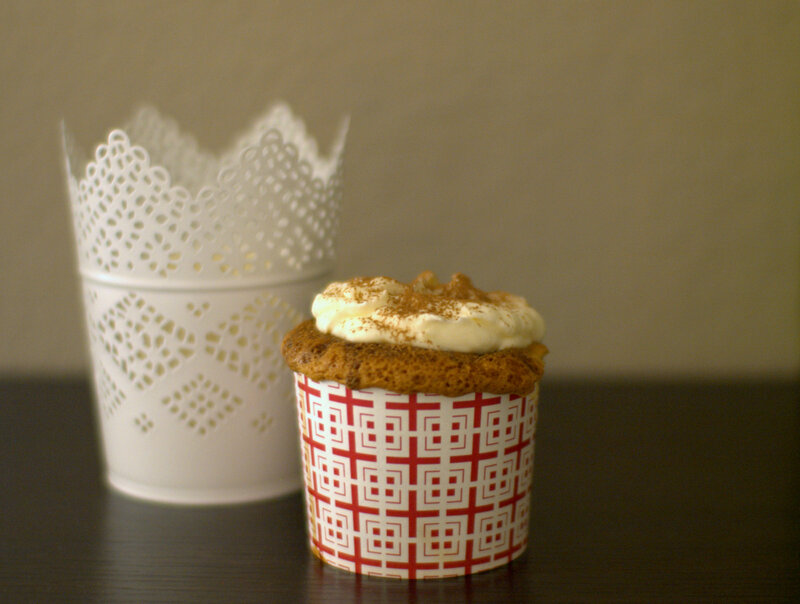 Hello, pretty little boozy tiramisu cupcake! You will not last long, sitting there adorably with your mascarpone floppy mop-top. 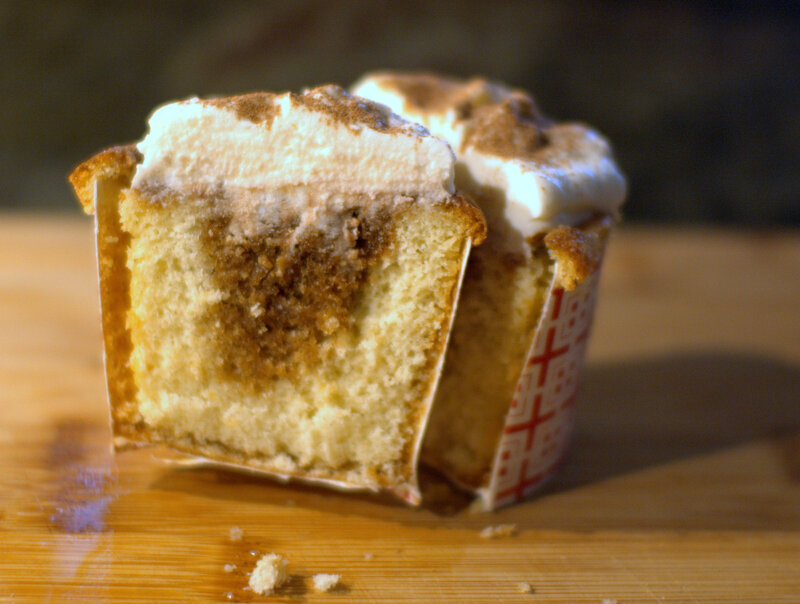 Thank goodness you were poked up by a fork straight out of the oven, now you can soak up that espresso-marsala syrup deep into the core of your cakey being. And oh, my! You may be cute and sweet, but you pack a caffeinated boozy punch. I highly recommend anyone who wants you in their life to watch the video(s) to get a better idea of how you, little cupcake, came to be constructed. Whilst packing for an all-day whale-watching excursion, I had a moment where I thought I’d slap together a good ol’ PB&J and call it a lunch. There is nothing dishonorable about this traditional option, but I decided on this day to honor the sea by treasuring one of it’s finest offerings, the humble tuna. 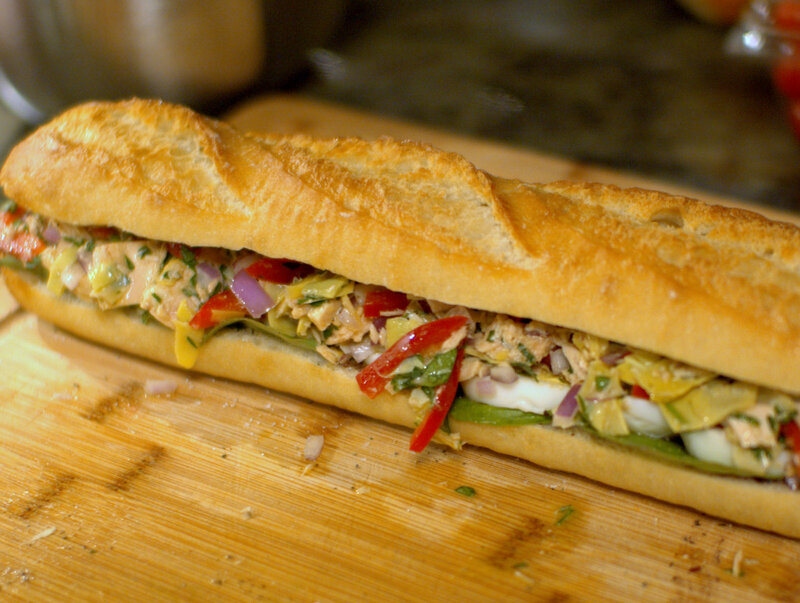 On the Mediterranean coastline of France, the clever and life-affirming residents of Nice created the best tunafish sandwich known to mankind, and it is the pan bagnat. The best quality tuna is simply dressed in fruity olive oil and acidic champagne vinegar or lemon juice. Leave the gloppy mayo to your tuna melts. Then you add in some vegetables for crunch and flavor (artichoke hearts, peppers, red onion), some nice salty olives, aromatic fresh basil, and hearty hard boiled eggs. 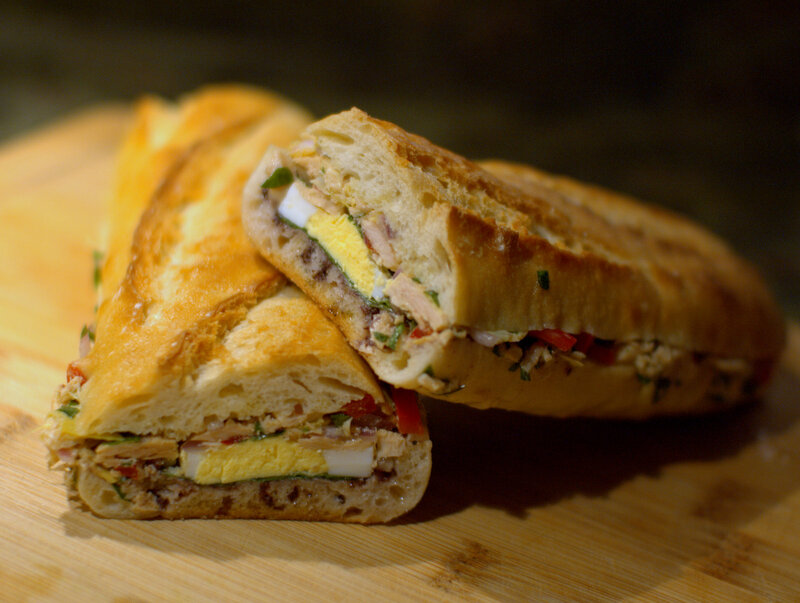 Add it all in loving layers to the partially hollowed out casing of a crisp baguette or boule. I used a mish-mash of this recipe from Food 52 and this one from Martha Stewart. 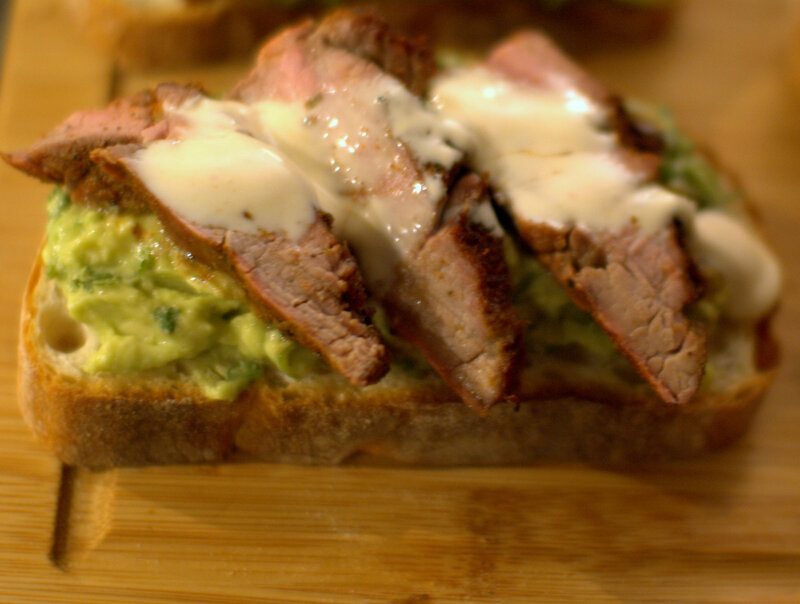 The beauty of this sandwich is that you can use up a lot of stuff laying around your fridge, pantry, and condiments shelf. No, the beauty of this sandwich is that you can make it entirely ahead of time, press it down in your fridge under a heavy skillet or a baking tray weighed down with heavy books overnight. 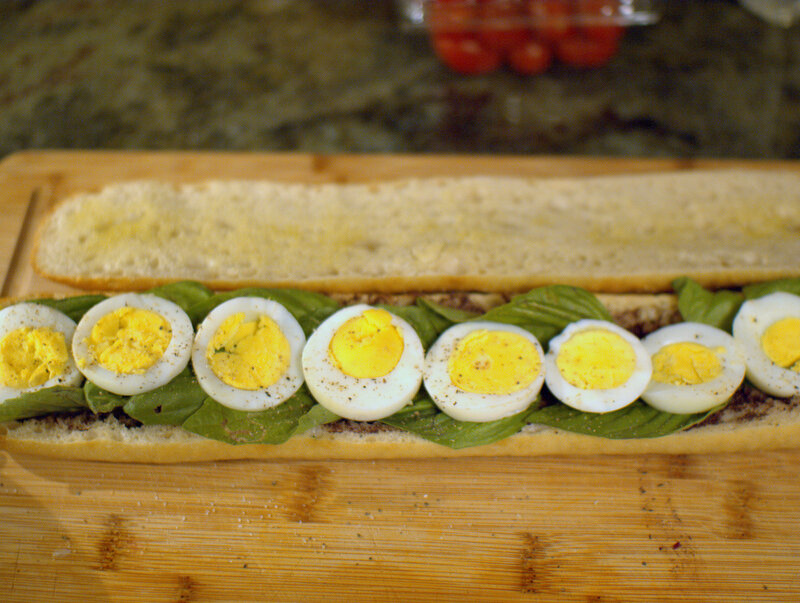 No, no, no the beauty of this sandwich is that you need to make it ahead of time, because the multitude of bright flavors really come together and then soak into the bread to make it taste even better after a night being pressed. 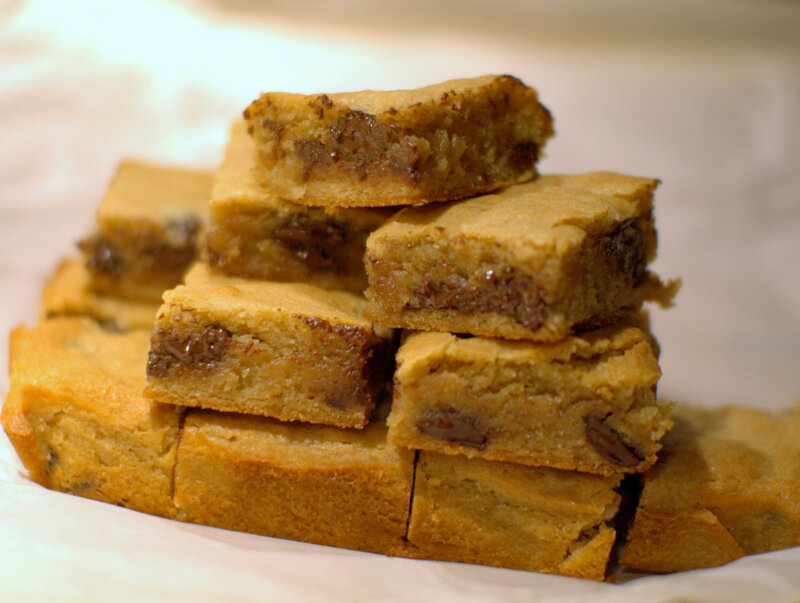 While you sit back and admire your work on a lunch well-packed, might I suggest adding these supremely easy one-bowl bourbon dark chocolate blondies? Whales will be watched, seas will be sailed, and tummies will be satisfied, fortified, and nourished to forge forward into the wild blue yonder. German chocolate cake is not German. The consummately American cake was created in the U.S. and named after an American chocolatier who worked at the oldest chocolate company in the U.S. In summary, German chocolate cake is named after German’s chocolate bar who created chocolate for bakers at Baker’s. Got it? 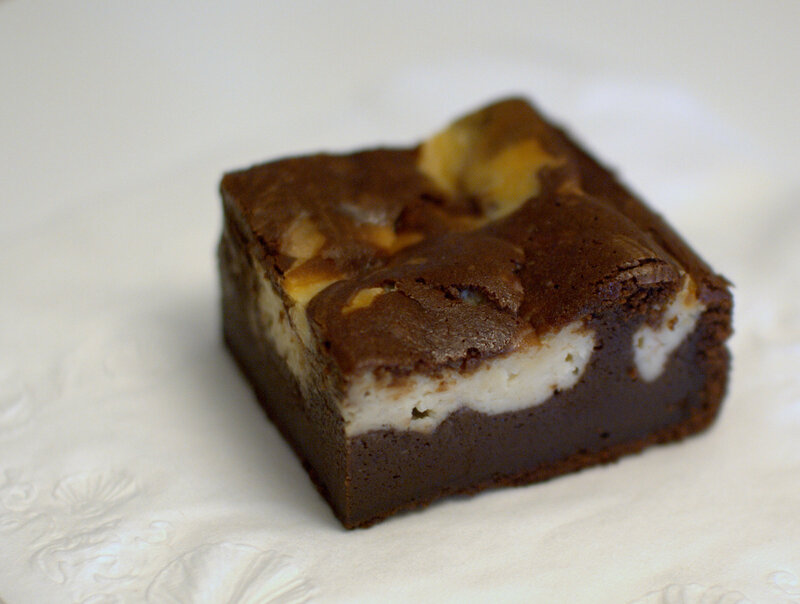 More precisely, the cake was named after Sam German, who created a more sweetened version of dark baking chocolate at Baker’s, the chocolate company founded in part and owned by Dr. James Baker. Phew! Can we eat it now? This beautiful version of German’s American Chocolate Bar for Bakers by Baker’s Chocolate Cake (which is a more accurate name for this confection, in my opinion) is brought to you by the Gramercy Tavern Cookbook. 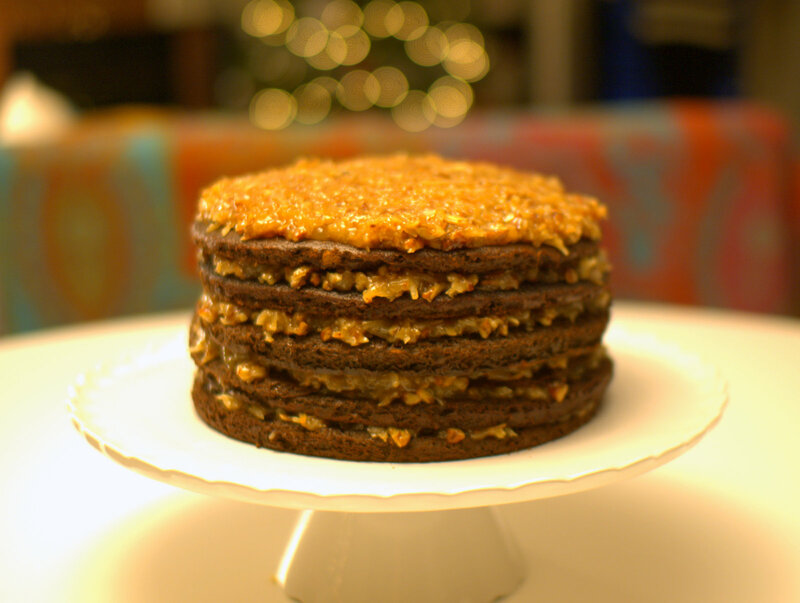 The cake layers are wafer-thin and deeply chocolatey. The filling substitutes the typical gooey sugar-bomb caramel with a more subtle, coconut milk-infused caramel that is chunky and crunchy. Double the recipe to achieve the height in the photo above to impress your guests visually, then barrage them with trivia about the cake as I have done to dazzle them with your knowledge. Or, as I should, just pipe down and serve it already. When I received dried morels as a gift, I set them aside for some time and consideration. I adore mushrooms and these fungi, with their clean-dirt aroma and nutty flavor, deserved proper celebration. On a winter night during a particularly damp weather week, we found ourselves craving these jewels of the wet earth and I brought them out from hibernation. 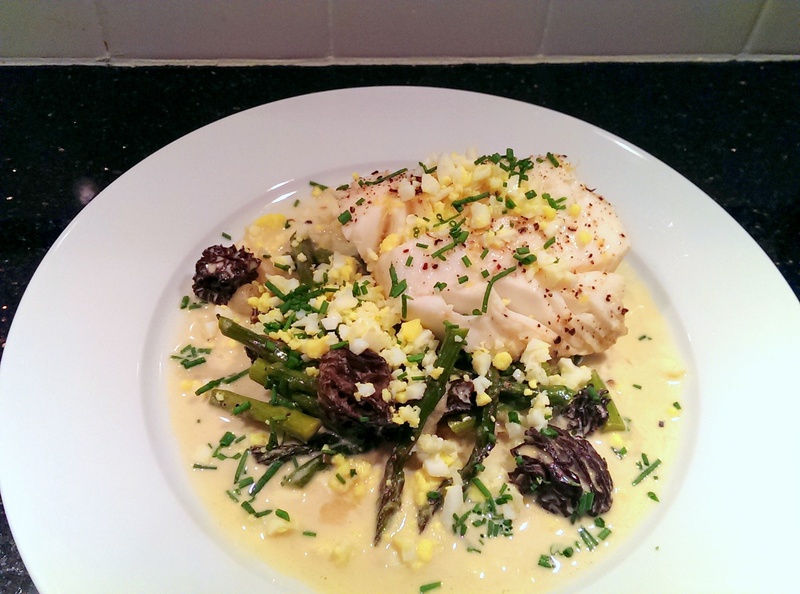 Morels go particularly well with the richness of butter or cream, so this cod recipe from Daniel Boulud was an obvious choice. Paired with fresh asparagus and sweet pearl onions, the delicate cod is not overpowered by any one flavor and the result is elegant and harmonious. 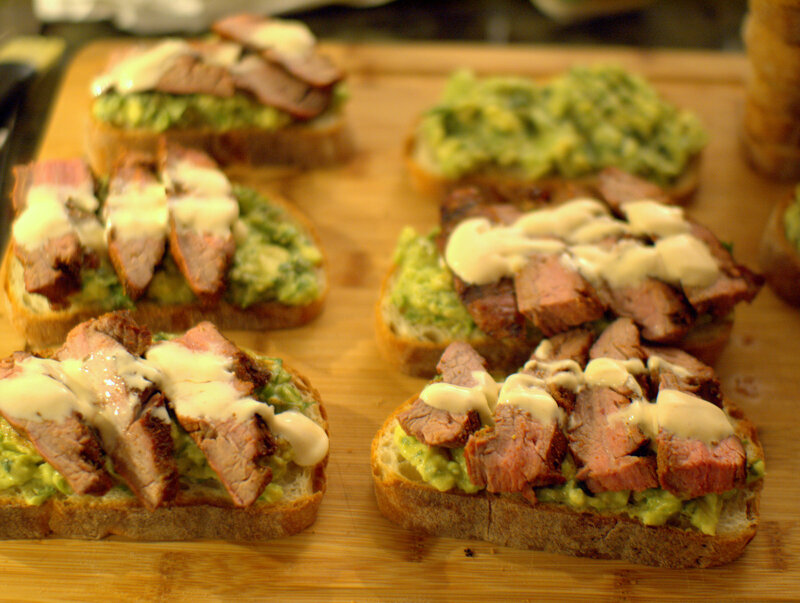 Initially, I was nervous that a recipe from the renowned chef would require intricate technique and specialty ingredients that would be too overwhelming for me on a weeknight, but this delightful recipe was not too challenging and in fact was a joy to make. 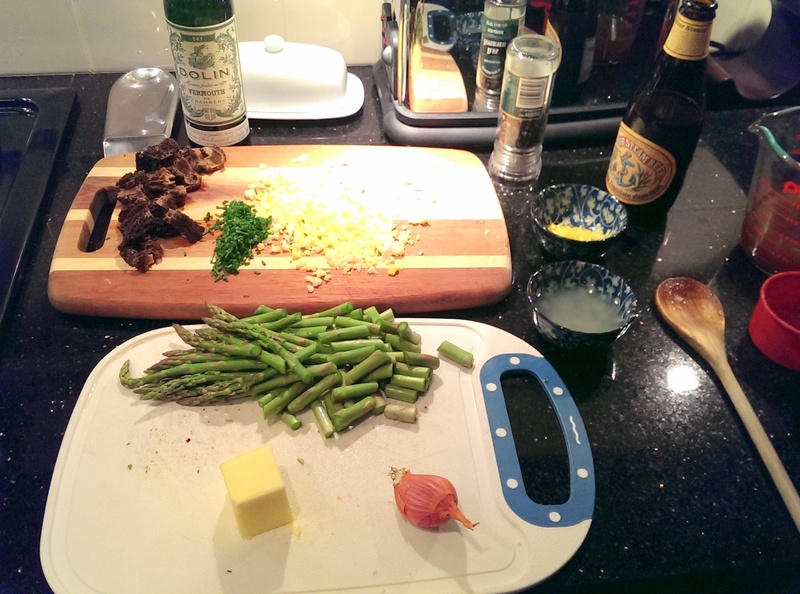 A good sign of fun in the kitchen: the enjoyment of an Anchor Steam while preparing the mise en place. “The intensity and character of the morel flavor is not lost in drying. We have used them after three years of storage and found them to be just as aromatic, if not more so, as when fresh. Reconstitute them in hot water for 5 minutes or simmer them in cream until soft, about 15 minutes, not allowing the cream to boil. Always add the rehydrating liquid to the dish for which your morels are intended. A great deal of the flavor remains in the liquid. 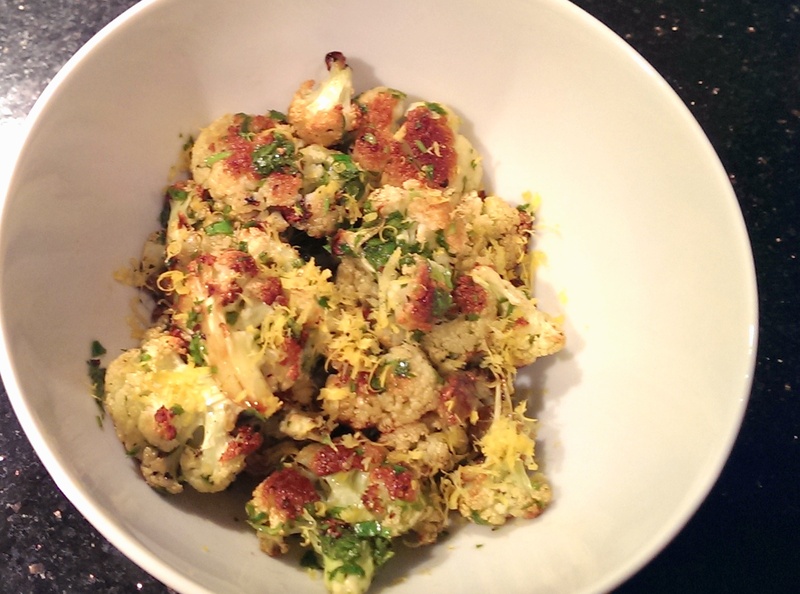 To round out the meal, roasted cauliflower with lemon-parsley dressing added some sweetness and zest to offset the creaminess of the cod’s sauce. 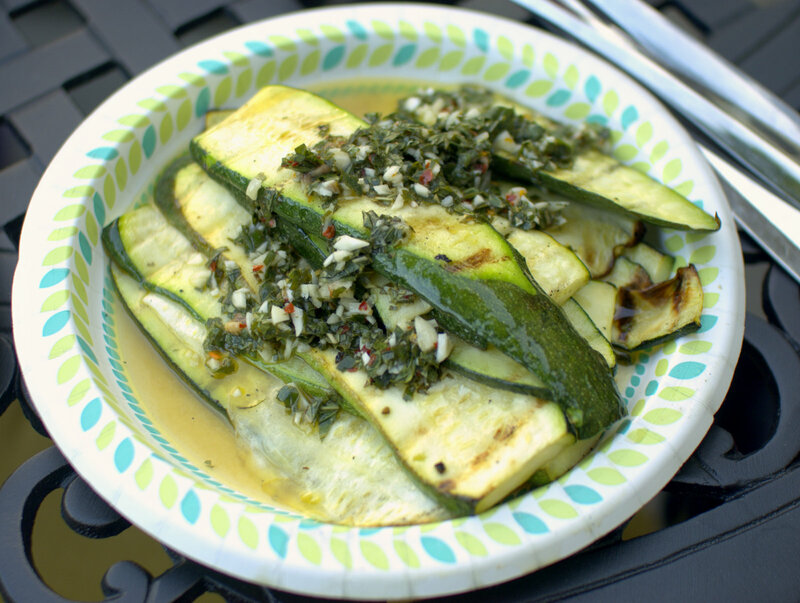 This side would be a bold compliment to any other fish dish or Mediterranean style meal, or even the holiday table. 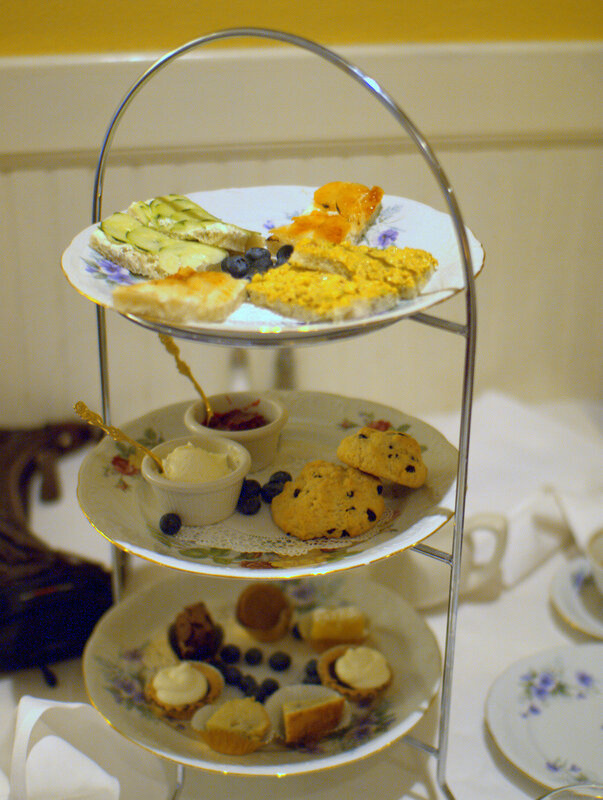 Perfectly proper tea at Chocolate Maven in Santa Fe for a refined bachelorette party. What’s better than birthday cake? 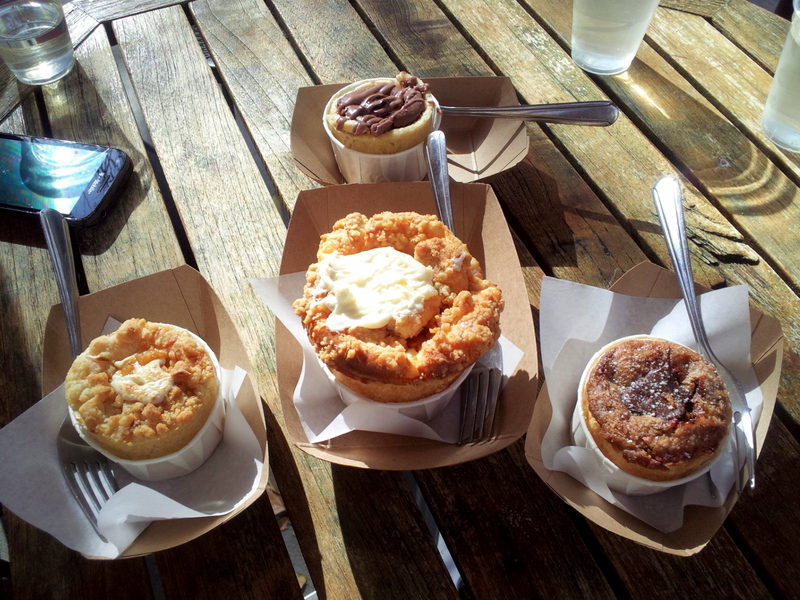 How about adorable, precious, and simply sweet tiny pies shared with birthday celebrants under the California sun, at I Like Pie in Claremont. 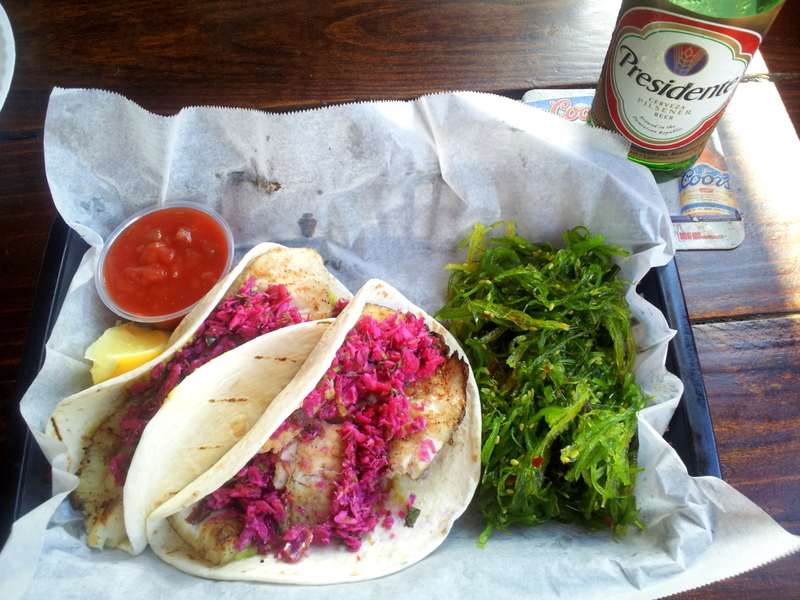 The freshest fish taco, plucked from the Caribbean shores off the Virgin Islands with a bright seaweed salad and a cool Presidente. 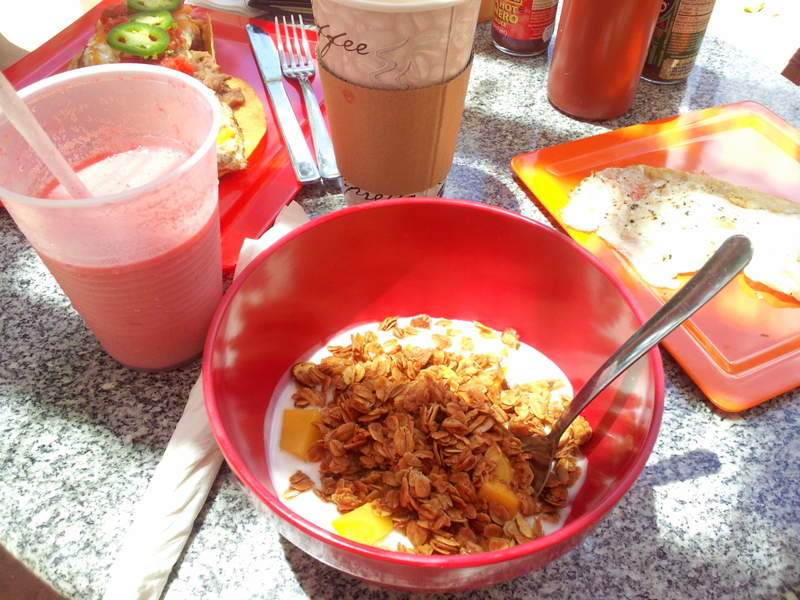 Island breakfast: fresh fruit smoothie, homemade yogurt with toasty oats and tropical fruits. Building a foundation for hours of snorkeling. 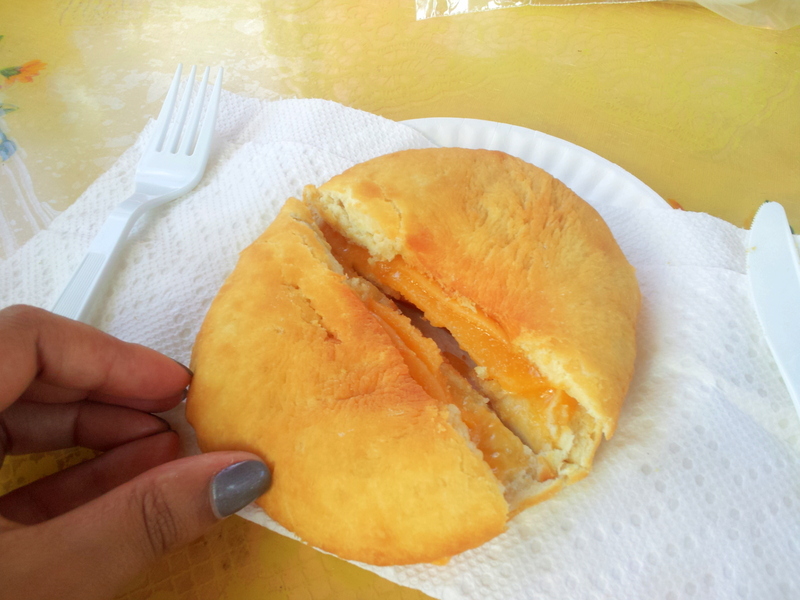 My first johnnycake: kind of like a biscuit top (crumbly and soft) with melty cheese in the middle. 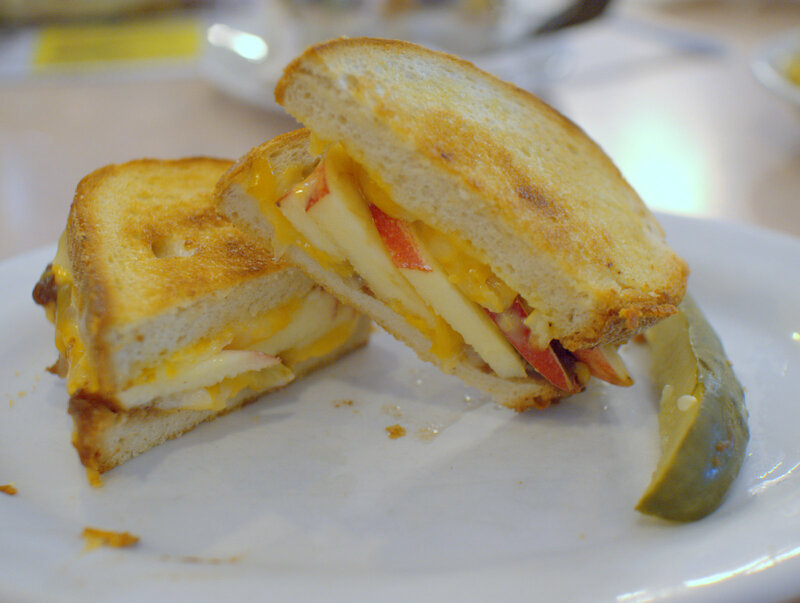 Island-style grilled cheese that I can get behind. 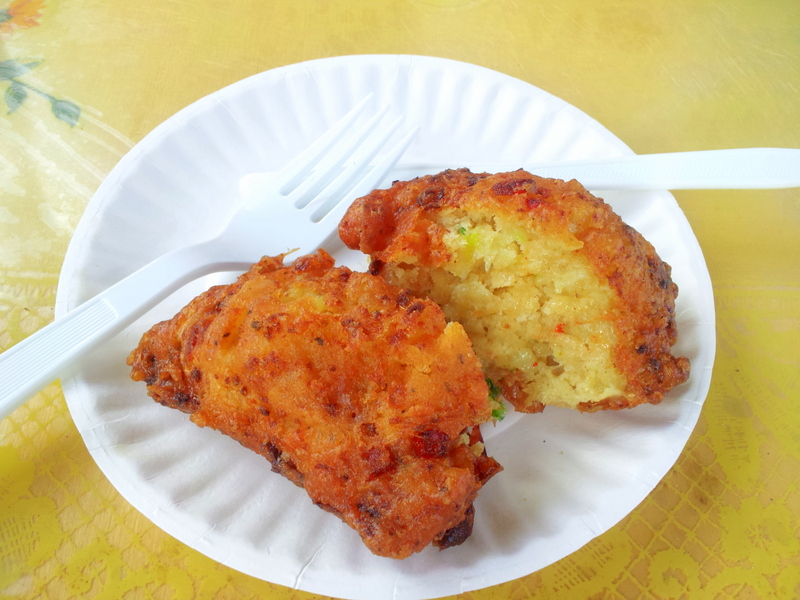 Crispy on the outside, hot and fluffy on the inside, this homemade conch fritter is like a subtly sweet hushpuppy. Served just steps from clear blue waters with sea turtles sunning themselves at Vie’s Snack Shack in St. John. 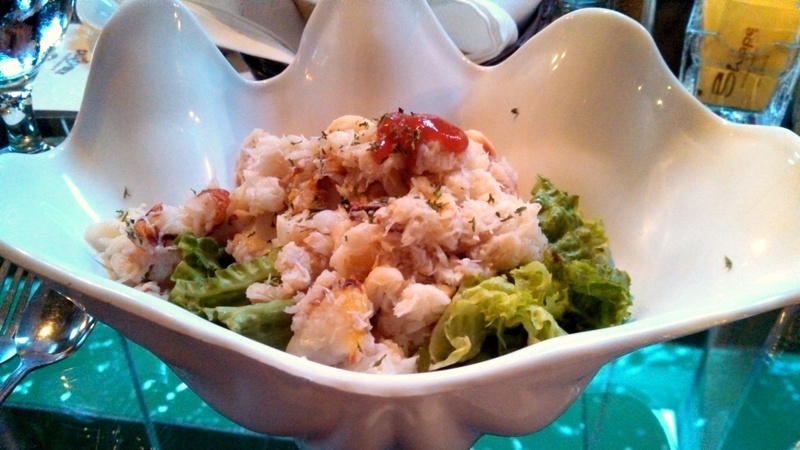 The fresh crab salad at the Olde Port Inn at Avila Beach is so fresh and succulent, you might forget to look through your glass table into the waters below. 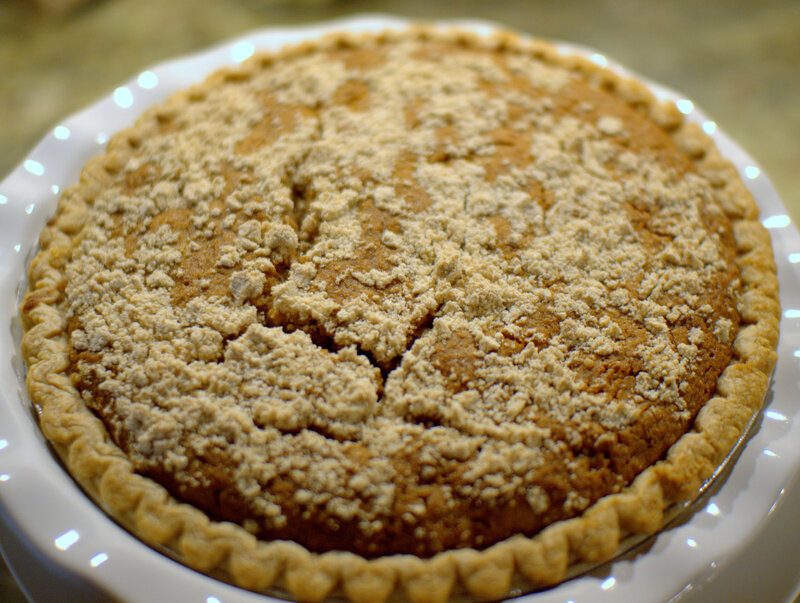 Pennsylvania Dutch food can be simple, comforting, homey. It can also be brilliant like this apple and gouda grilled cheese with a smear of sweet apple butter. 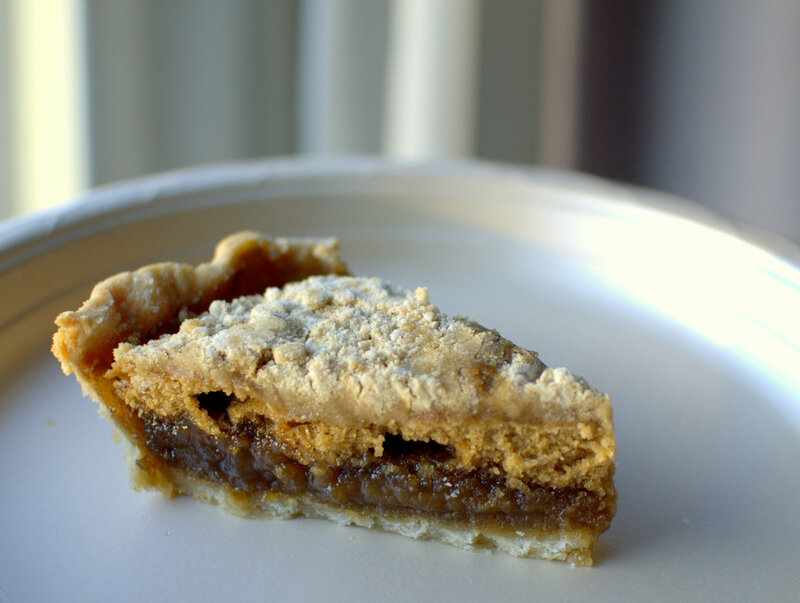 But please don’t event think of leaving Lancaster without a slice (or 8) of the sticky molasses bottomed and crumbly struesel-like topped shoofly pie. Strawberries and cream from America’s oldest ice cream shop, Bassetts in Philadelphia. 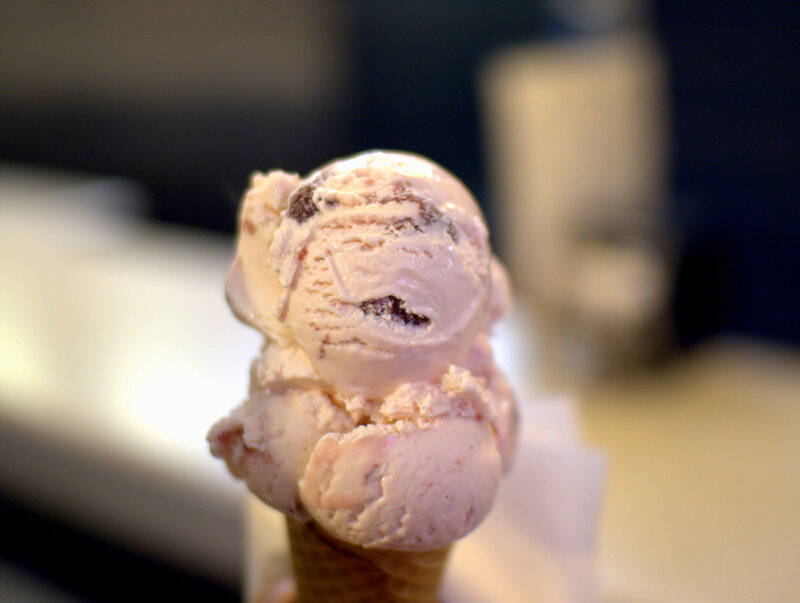 There’s a reason this classic ice cream flavor is favored by many: when it’s simply made with the best ingredients, you taste summer down to the last melted drop in the cone. 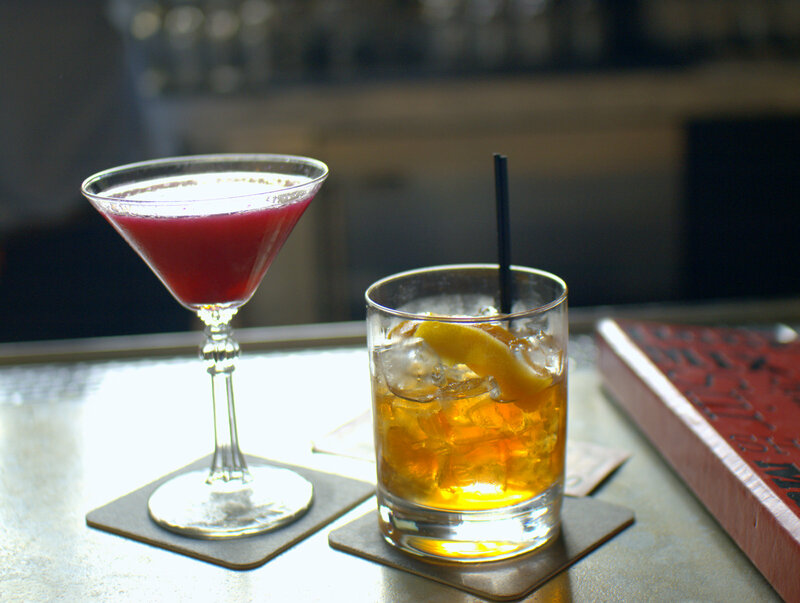 Pre-partying for BFF wedding duties with fantastic cocktails at the Red Owl Tavern in Philadelphia: Tom Traubert’s Blues and Of Two Minds. 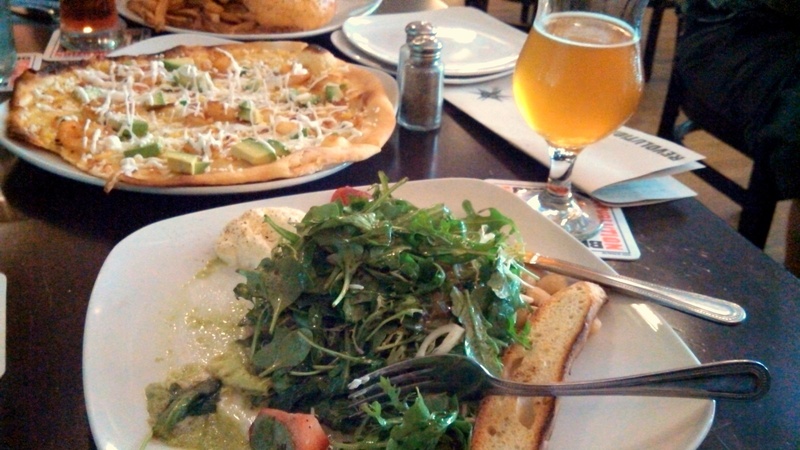 Tackling a wood-oven baked pizza with plump shrimp, sweet corn and avocado while devouring and arugula and strawberry salad with creamy burrata at Revolution Brewing in Chicago. Paired perfectly with the Coup d’Etat. 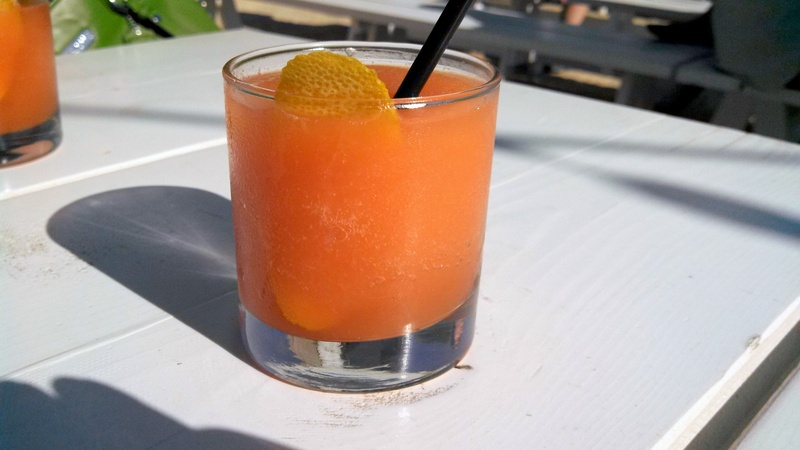 Parson’s Chicken and Fish is a summertime DO for the Negroni slushy best consumed while making friends at the outdoor picnic tables on a warm Chicago day. Nevermind that it’s not legitimately a Negroni without the Campari, but it is legitimately delicious. 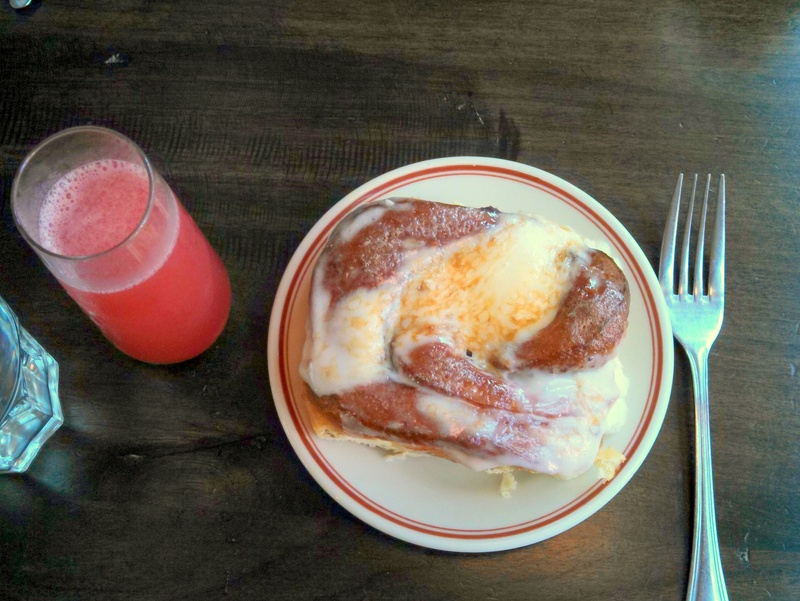 The stuff sugar-dreams are made of: the ooiest gooiest cinnamoniest sticky bun at Little Goat in Chicago. Can’t decide on breaky? 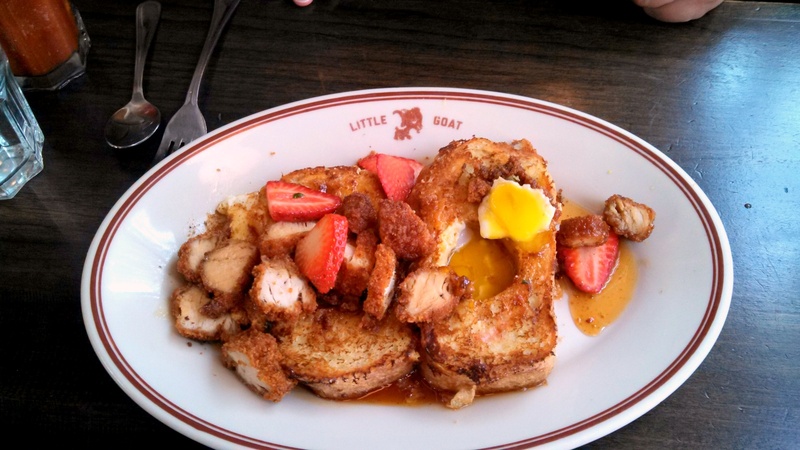 Have eggs-in-a-hole French Toast with strawberries and fried chicken. 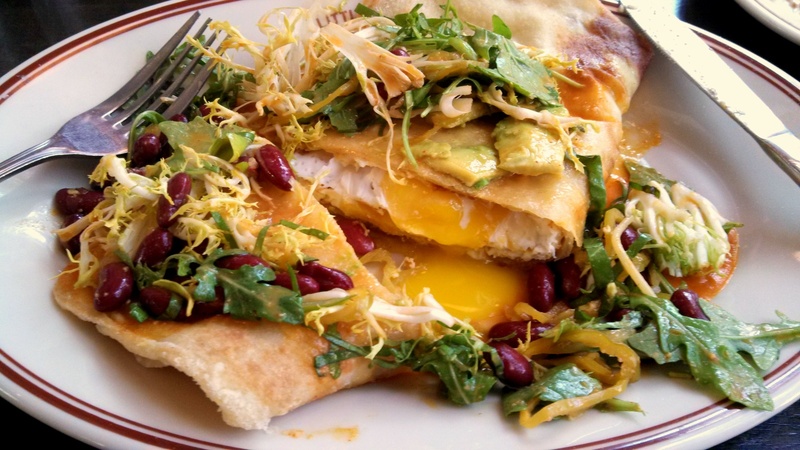 Or an Indian-Latin American-Californian hodge-podge like a paratha egg burrito with avocado and beans. 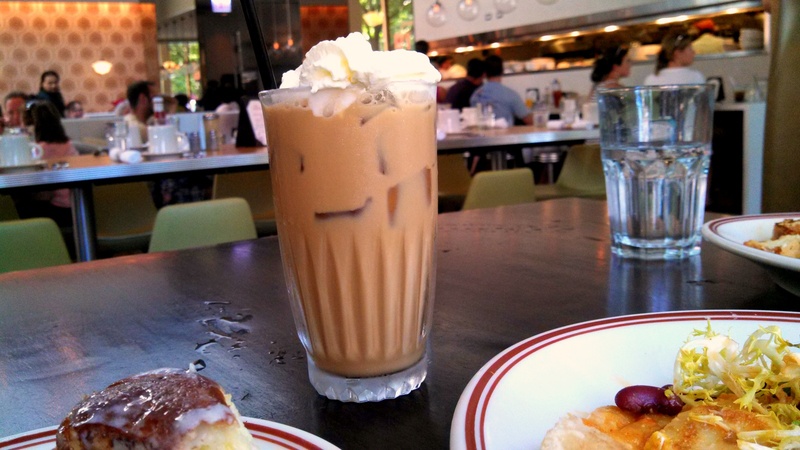 The best part of my entire meal, without a doubt, was that 10AM Vietnamese iced coffee spiked generously with single barrel bourbon: thank you for this revelation. 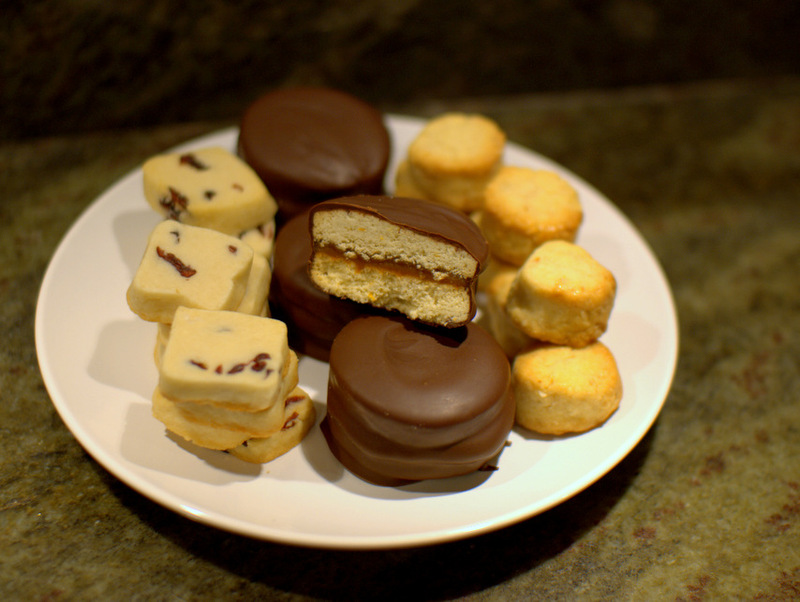 In the middle are luxurious Argentinean alfajores, or hockey pucks as Pat calls them. 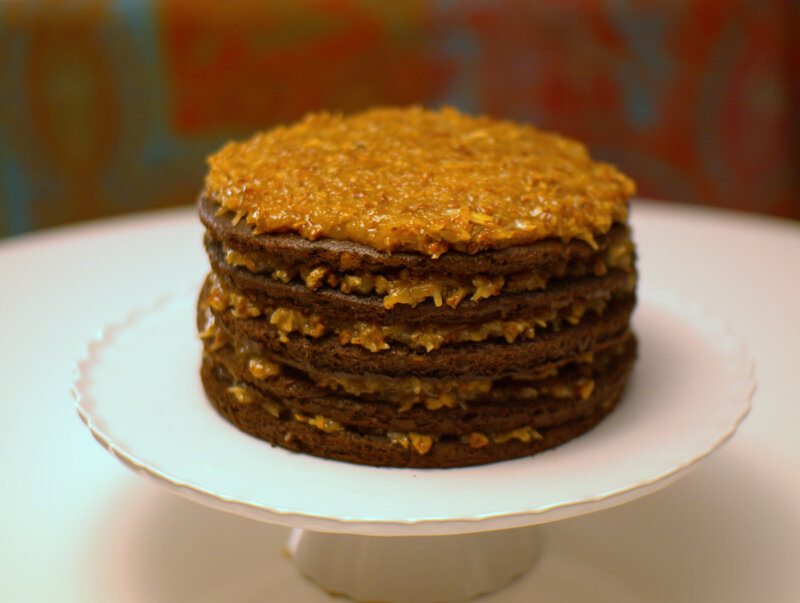 The crumbly cookies sandwich golden dulce de leche and then are dipped in chocolate ganache like these. You can also cover them in coconut and marvel at your fine fancy hockey pucks. On the left are incredibly easy but richly rewarding cranberry shortbread which are buttery and punchy with bits of tart cranberry. These are convenient to make the dough ahead of time and slice and bake as you need them. And they look festive, too.